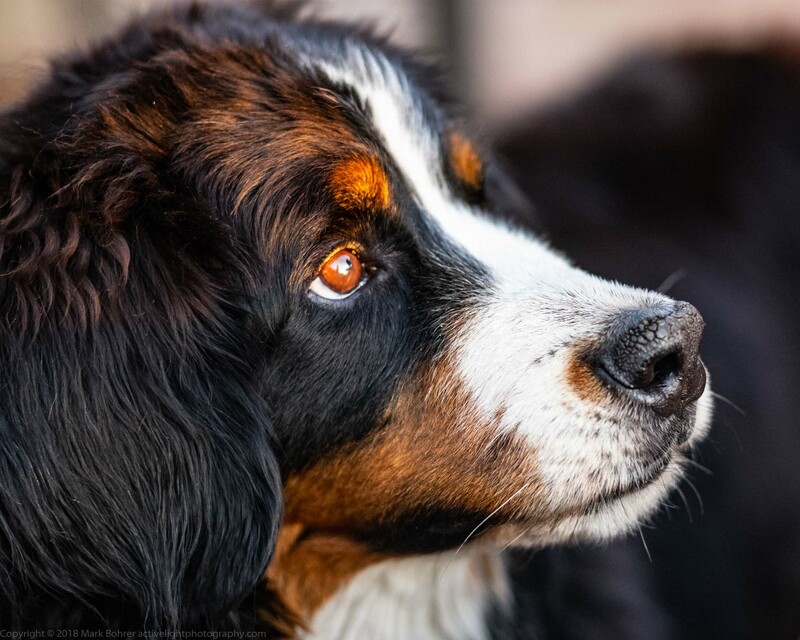 I’ve been shooting a lot of dog pictures in the last few months. 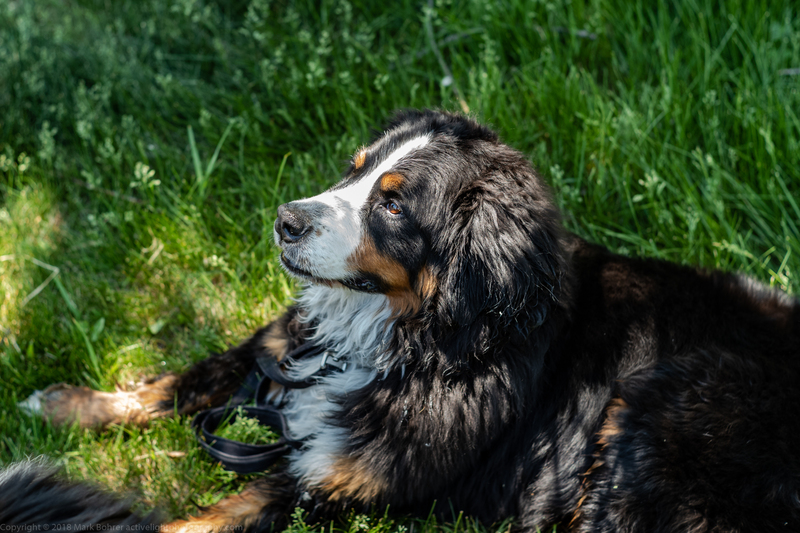 Bernese Mountain Dogs can be charmingly playful, and they’re very cute besides. 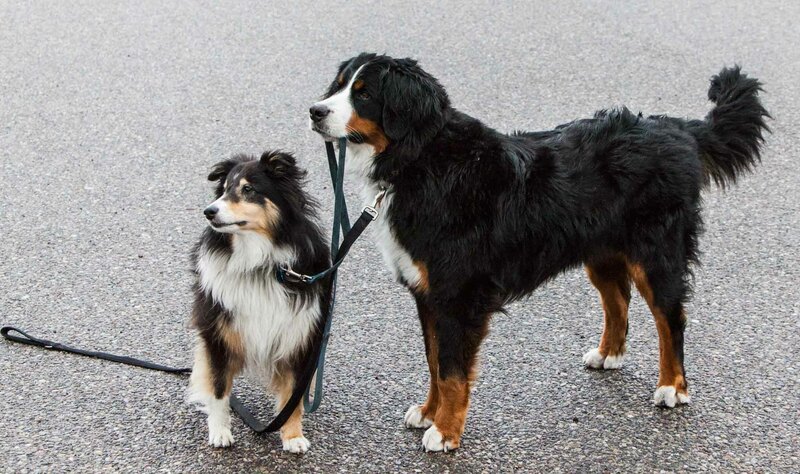 Our Berner Daisy has always been a star, usually getting our tri-color Sheltie Buzz ignored when they’re out walking with us. This isn’t Daisy’s fault – she can’t help being cute. 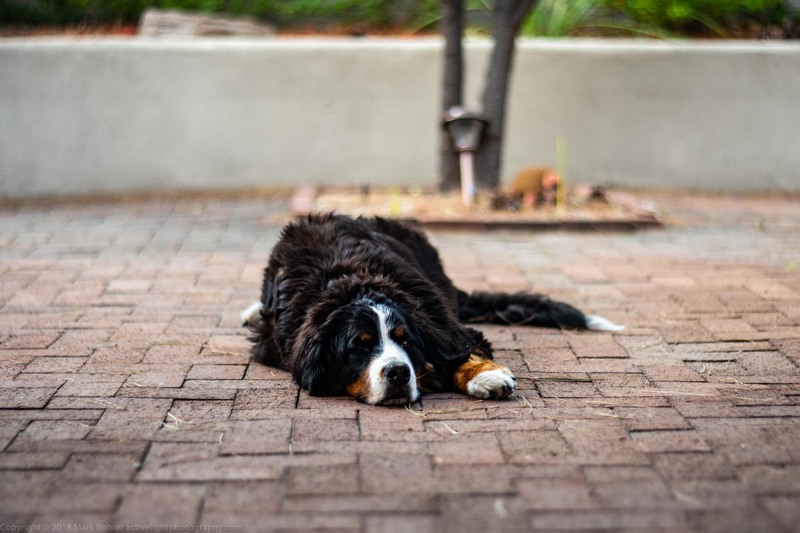 Unfortunately, she was diagnosed with histiocytic sarcoma, the Berner cancer, last July. 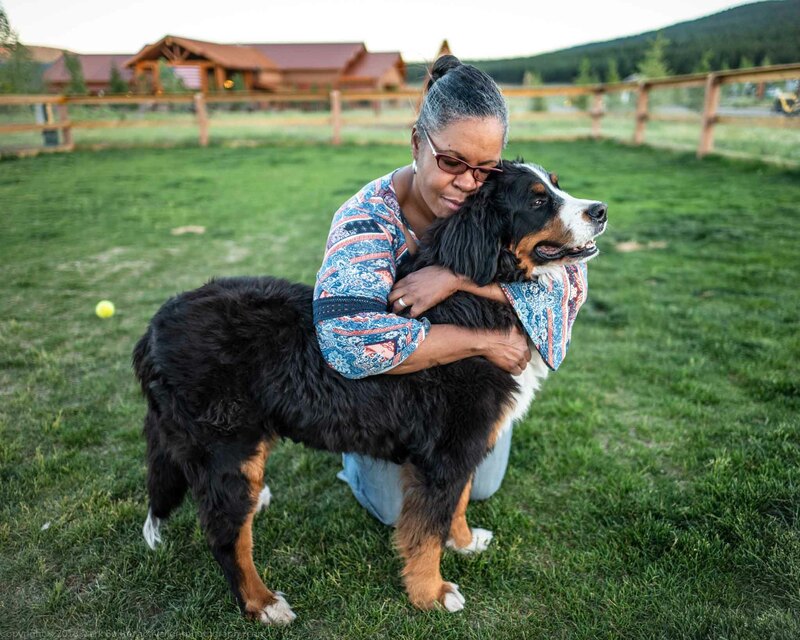 It took some searching through vets who were ready to give up, but we found help at Veterinary Cancer Care of Santa Fe. Chemo treatments there from Dr. Jeanette Kelly helped Daisy get better and thrive for the next nine months, until last April. But histio is nasty. It tends to mutate and kill within the first month. Daisy’s beaten the odds for the last year, joining the 20% or less of pups who make it that far with histio. 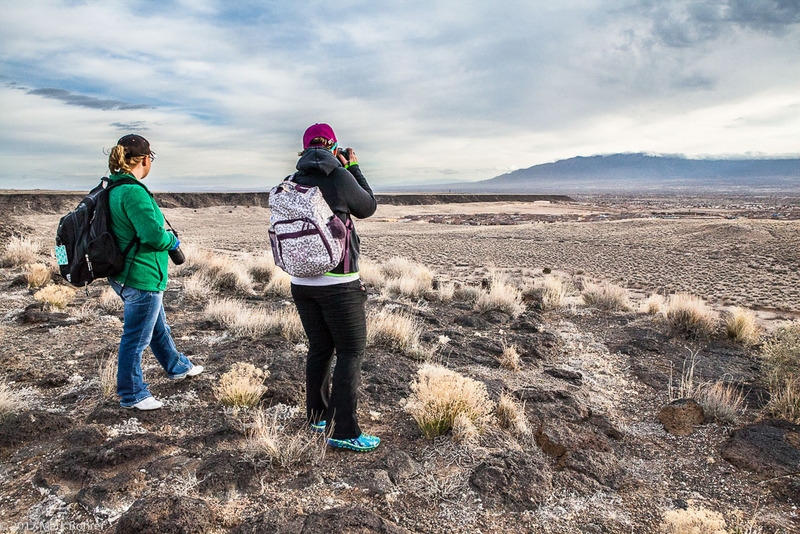 Want to explore Southwestern ruins, slot canyons and petroglyphs, without worries about finding the best spots? Need some suggestions for better shooting, along with the backstory on unusual subjects? Check out a guided photo tour with me! 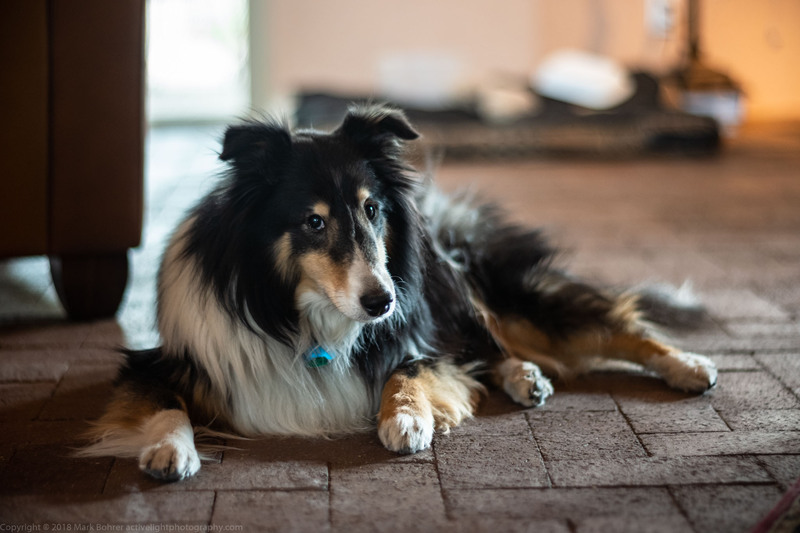 I approach pet photography the way I go after wildlife shooting. I don’t use a studio or fancy location light setup, but always look for the best natural light wherever the action is. I research behavior in advance, and maximize my chances of getting what I want. The other thing I look for is eyeshine – the catchlight in their eyes. This makes any subject look more alive. 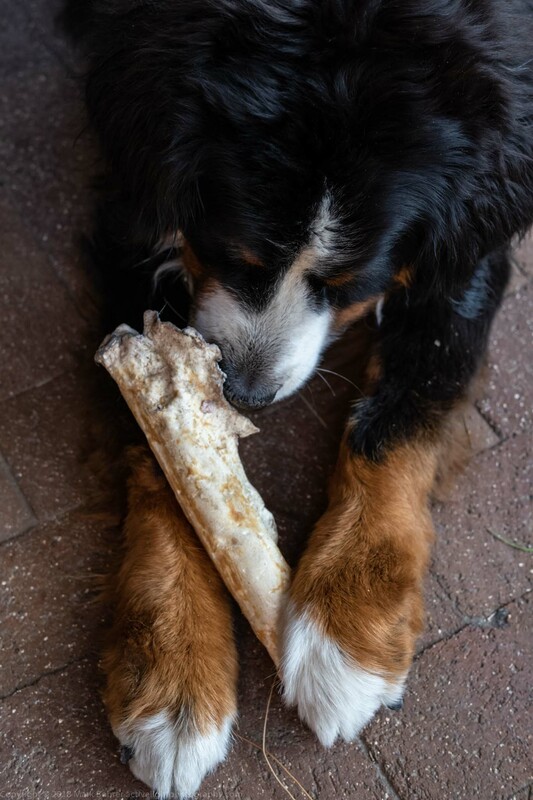 Dogs are always searching for something – toys, bones, playmates, and yes, more tasty tidbits. They can’t help this – it’s instinct, built-in. So catching them feeding or playing is natural. It becomes simpler in light I know well – inside our house, out in our favorite local dog park, almost anywhere outside in winter. I usually wait for morning light inside, finding an uncluttered background to shoot against. Both pups have favorite spots to lie down. To a limited extent, I can control this with obedience commands, placing them closer to where I want. But Daisy has a mind of her own, and won’t always stay put. 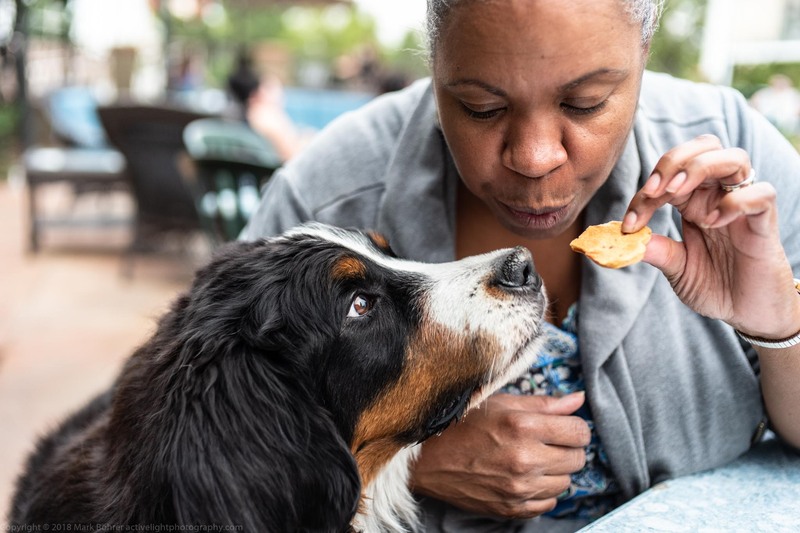 Yes, dogs respond to food. But they respond better to food from their favorite person. Daisy will just about nibble my wife Pat’s fingers off when she’s getting a table scrap or treat. Buzz will follow me all around the house. Actually, he’ll follow me anywhere. At first, it was impossible to go to the bathroom unsupervised. Daisy is Pat’s dog. She will wait by the front door at 5 pm, when Pat usually walks in from work, and perks up when Pat’s home. (We all do.) So Daisy ‘turns on’ most for her favorite person. That happens here at home, but also on our travels. 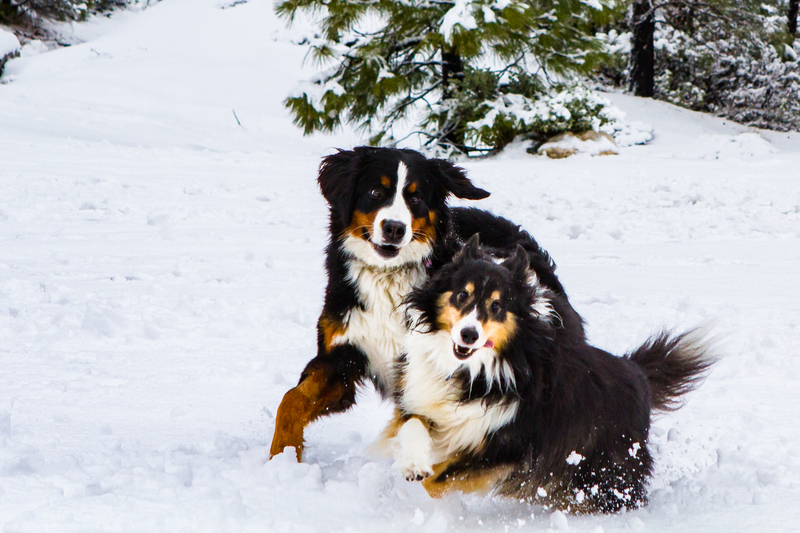 At Angel Fire Resort, Daisy and Pat were just relaxing in a large off-leash dog park. I waited for the best moments, and shot. And shot again. Daisy will chew a no-hide dog chew for hours if we let her. Instead, we supervise her closely and only allow her 10-15 minutes. (She’s demonstrated an amazing ability to bite off and swallow awkward-sized pieces that could stick in her throat if she’s allowed to chew longer.) Photographing her chewing is easy, and she presents many different postures and expressions for a shot. 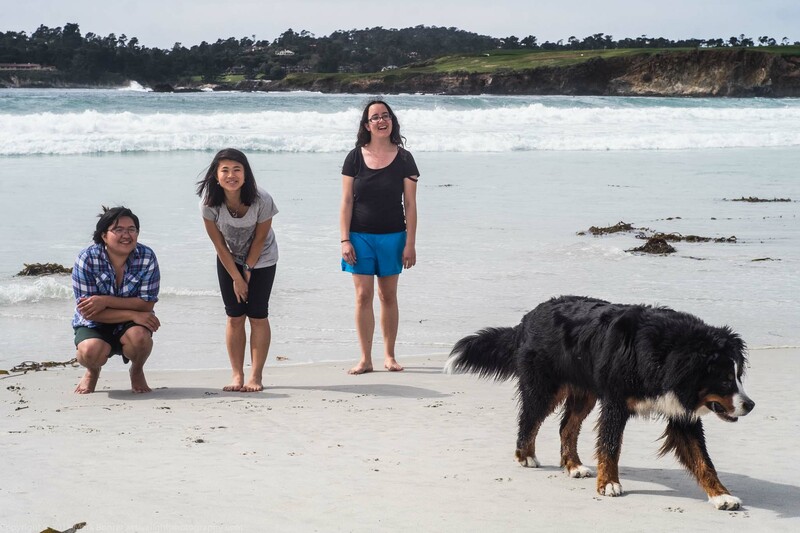 Daisy seems to like humans (well, us) better than dogs, but she will interact with other pups. 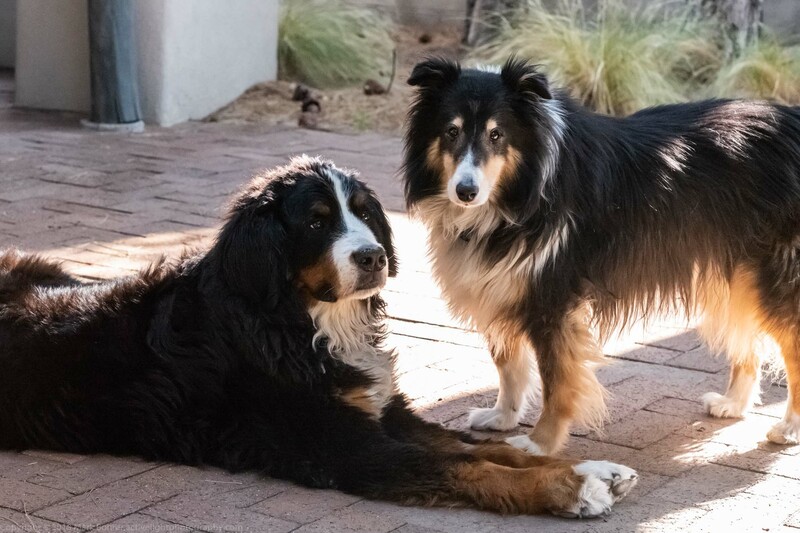 She’s posed well with her step-brother Buzz. And her ignoring people she doesn’t know can be a good story too. Smells can stop Daisy in her tracks. She may appear to be thinking visionary thoughts as she stares into the distance, but it’s much more likely there’s a dead elephant seal or a steak in the area. Her pointer-like posture gives great photo opportunities, especially with striking environmental backgrounds. These ideas just scratch the surface of pet photography. It’s a lot like shooting wildlife – research your subject’s interesting behavior, and figure out where and when they do it. Autofocus lenses remove the focusing problem in good light, but a dSLR’s AF may have trouble when it’s dim. I figure out Daisy’s usual path in our yard, focus manually to a mark she usually passes, then take the shot when she walks past the mark. This works best with a 35mm or 24mm lens – something with a little depth of field so I can miss focus a bit. I use a 75mm f/2 or 90mm f/2 for portraits, same as with human shots. Both allow me some working distance and good isolation at f/2. Viewers want to see sharp eyes (especially the nearest one), so that’s where I focus. With dogs you don’t know, kneeling down for the dog’s eye view shot may entice them to investigate you. Your best bet is to kneel and shoot while they’re distracted by another dog or human they’re playing with. 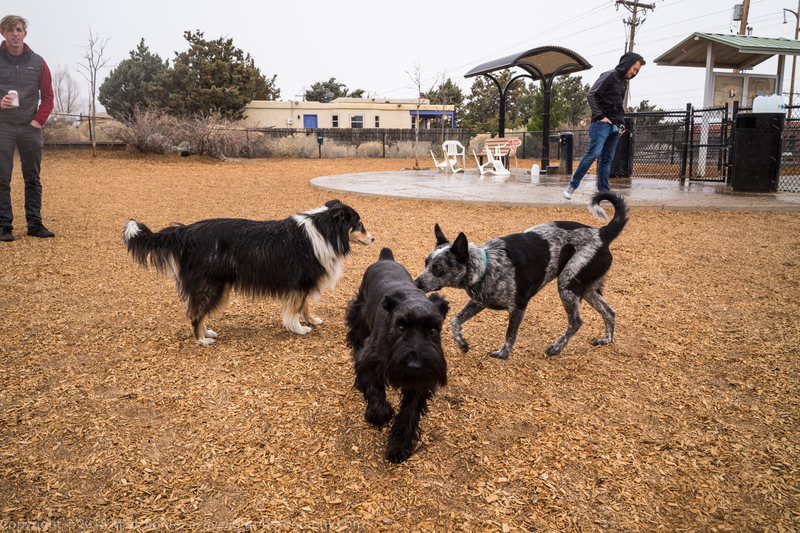 I like the 35mm f/2 for environmental shots at the dog park, and 75mm when I want to isolate action. I forget where, but a long time ago I read that when you have a great shot in front of you, keep shooting. And shooting. Don’t stop until you run out of film (doesn’t happen these days!) or the action stops. Daisy’s prognosis isn’t good. At the start of August, Dr. Kelly told us Daisy likely has just one more month. But we’ve been fortunate to receive her freely-given love, and enjoyed all the traveling and good times. She’s always been there with a wet kiss or a doggy grin, and we’ve tried to give her the best care we can. We’ll miss her way too much. It makes me sad to see these beautiful photos of Daisy! She was such a beautiful girl! Ina, we miss her a lot. It’s like stubbing a toe – once in awhile, something we see or do brings up a memory, and makes us sad she’s gone.